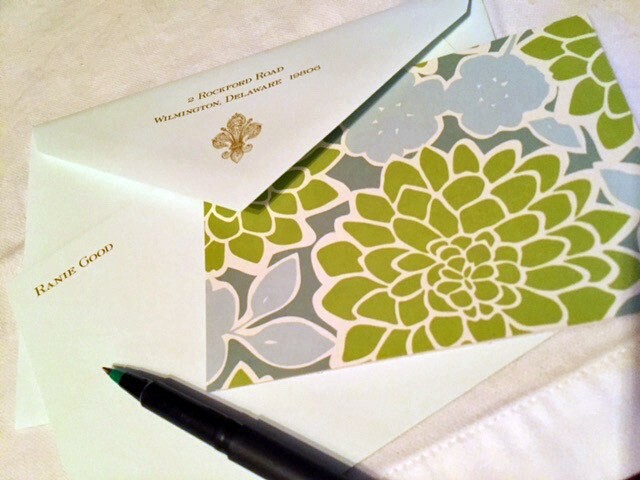 Call me old-fashioned or southern, but my mother raised me to send handwritten thank you notes. Someone provides an introduction – thank you note. Hosts you in their home – thank you note. Donates to a cause that you support – you get the idea. Sure, it’s fine to send a shout out on social media and even better when you express your thanks by including a real-time photo or video clip of what’s going on. My differentiator, however – my edge – is heavy stock, sea glass colored, engraved panel cards with my name and return address in gold. My hope is that the recipient recognizes the care and investment I’ve taken to create personal stationery. I want them to know that I took the time to sit at my desk and reflect on their thoughtfulness or generosity as I wrote my thanks by hand. I also hope that in a world of lightening-fast electronic communication my correspondence makes them feel special and that my thank you sets me apart in their memory. But you don’t have to send handwritten notes to stand out. Marketing is all about branding and differentiation. Find your differentiator and then leverage your edge.